Minitokyo »	X Wallpapers » X Wallpaper: Zero Who? The wall was done in few days, supposedly took time about 20 hours or more. I tried to play with the lighting and color composition to bring on the cold, evil mood (which suits Zero, yet I like Kamui's being evil *grin* ). I also separated the colors, so that it's dominantly grey overall the wall. Kamui's scan was taken from here. The Zero mask is vectored using Adobe Illustrator, and the Geass effect was done in Photoshop. The coat was also taken from scan, which was then redone in PS due to some color difference. The thumbnail seems way too coarsed, please full view for better details. wow! 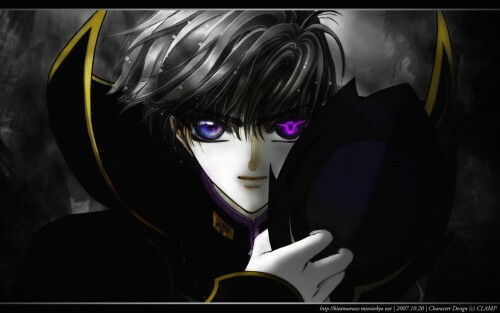 mix of geass and vimpire knight! love it! I was looking for a wallpaper and I barely hesitate between Kamui and Lelouch when I found this : EXCELLENT and thanx ! this looks really cool and hott.